Well above average temperatures remain locked in for the Central Gulf Coast. An area of high pressure will allow a temporary dry period. More active weather and much cooler temperatures are found in the extended forecast. Today and Tonight: Mostly cloudy skies will continue through the day with some occasional glimpses of sunshine. Expect high temperatures to peak in the mid 70s, followed by lows in the low to mid 60s. Up Next: By Wednesday, a warm front will begin to lift through the area creating a few showers, though they should only be isolated in nature. This warm front will be associated with a significant system that will create severe weather to our north, with an isolated strong storm or two stretching as far south as I-10 when the cold front arrives Thursday afternoon and evening. Rain and storm coverage will be highest late Thursday through Friday morning. Temperatures will cool quickly as we approach the weekend. The cold front will push into the Gulf Friday morning and high pressure will build across the region. Temperatures will drop below average with highs in the low 60s and lows in the low 40s Saturday and Sunday. However, mostly cloudy skies are expected to stick around. 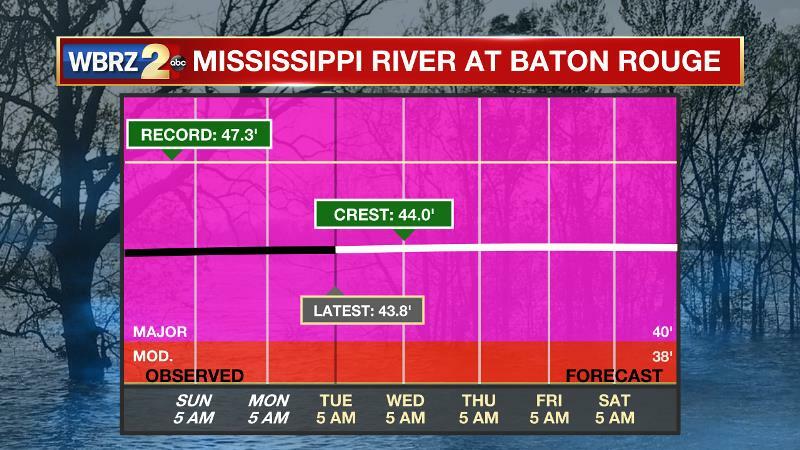 The Mississippi River: At Baton Rouge, major flood stage continues with a level of 43.8’ as of Tuesday morning. This week, the river is projected to crest at a level similar to what was reached last year around 44’. With much more rainfall north of the area, runoff will keep the river near this crest for the next several days. The high water is primarily an issue for river traffic and river islands, although some inundation will continue for a few spots north and south of Baton Rouge that are not protected by levees. Unprotected low-lying areas will be flooded and agricultural operations will be impacted on the west side of the river. The grounds of the older part of Louisiana State University's campus become soggy. This includes the area around the Veterinary Medicine building, the Veterinary Medicine Annex, the stadium and ball fields. The city of Baton Rouge and the main LSU campus are protected by levees at this level. An upper level ridge of high pressure will flatten a bit through Tuesday in response to a strong storm system moving into the Midwest. Continued southwest flow aloft will result in moisture streaming across a stationary front in the Gulf of Mexico leading to mostly cloudy skies on Tuesday. On Wednesday, a very deep surface low will develop in the Central Plains lifting a warm front through the local area. Onshore flow will bring warmer, stickier air back inland. An isolated shower or thunderstorms may develop as this front navigates northward. On Thursday, the advancing storm system will send a cold front into the Central Gulf Coast region with a round of rain and thunderstorms. Rain should end from northwest to southeast on Friday morning as the front sags into the Gulf of Mexico. Behind the boundary, much cooler temperatures are anticipated for the upcoming weekend. Highs will struggle to reach the low 60s on Saturday and Sunday. With dew points in the 30s, lows will be able to dip into the low 40s. The caveat is that with continued southwest winds aloft, any weak disturbance moving through the upper levels could instigate mostly cloudy skies and even some shower development—especially on Saturday. This will need to be monitored for outdoor events.